On Tuesday 13 May BreaCan celebrated National Volunteer Week with an afternoon tea at the BreaCan Resource Centre. Ms Elizabeth Miller, State Member for Bentleigh attended the celebration and spoke on behalf of the Victorian Government. Ms Miller touched on the importance of volunteers within the community but also on the value of peer support. 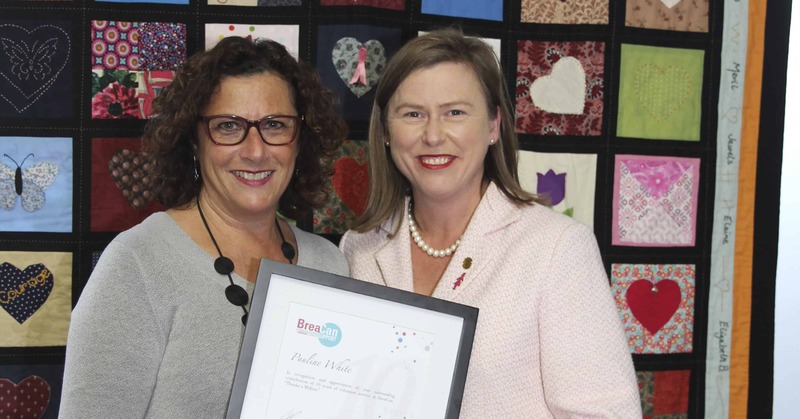 She also highlighted the unique and valuable service BreaCan is to Victorian women diagnosed with a gynaecological or breast cancer with its “award winning” model, ability to recruit and retain highly regarded volunteers and openness to service improvement and development. Volunteers are the cornerstone of the service and some have been volunteering for over 10 years. The BreaCan peer support volunteers share more than their time; they share their personal lived experience of breast or a gynaecological cancer. Without them the organisation would not be able to support women diagnosed with cancer to live well during and beyond their cancer treatment.